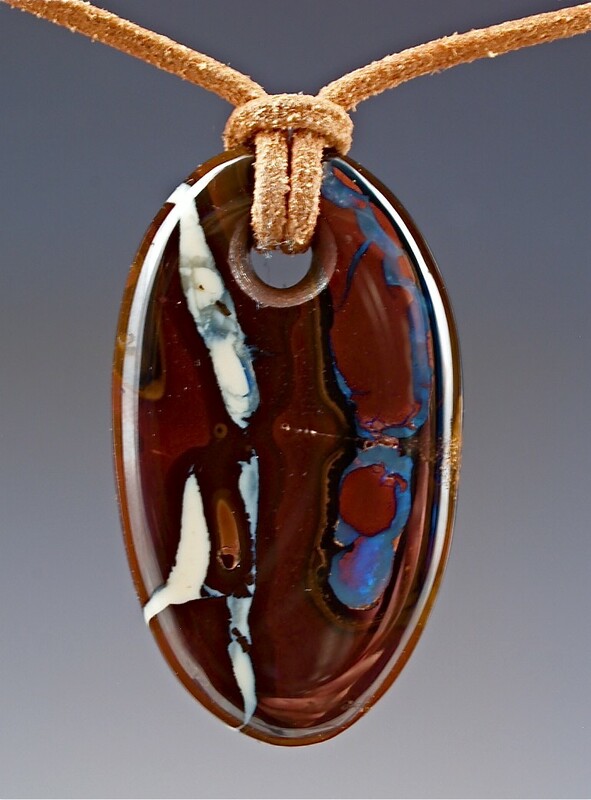 Marcus Scott as he can be seen at Lithia Artisans Market, most weekends along Ashland Creek from spring until fall. Marcus Scott is the owner of “The Stone Bead”. 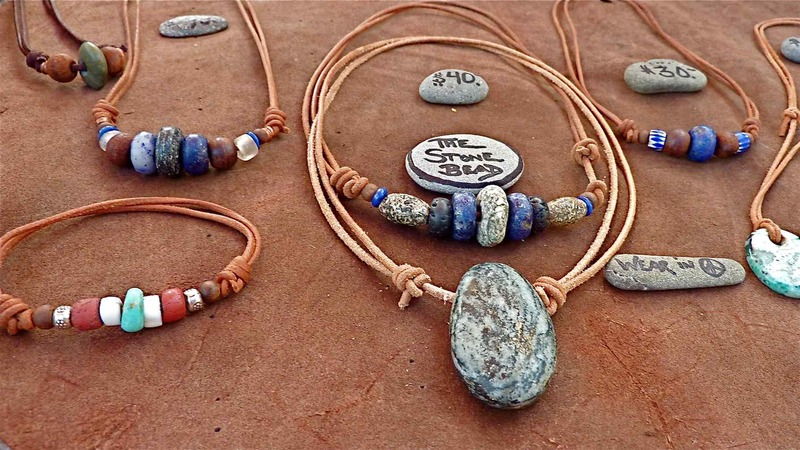 He turns found stones into beads, pendants, and earrings. 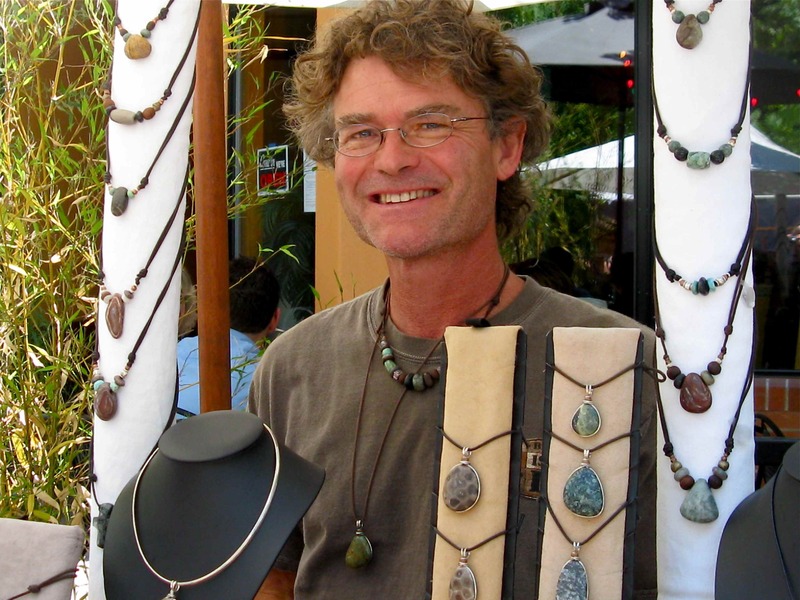 His wearable art pieces can be found at Lithia Artisans Market behind the plaza from spring until fall, and at Farmers Market here in Ashland on Tuesdays. Marcus is an Ashland native, kind of a rarity in these parts. His pieces are down to Earth, simple yet beautiful. Marcus and his stone beads are Oregon to the core. Marcus, I thought it was finally about time that we did an interview with you to learn more about the man behind the scenes. Tell us how you first became fascinated with your craft and how it has turned into a life long passion? It was 1991, I was a young man, mid-twenties, just out of college traveling around southern Mexico and Central America. I started noticing ancient, pre-Columbian jade beads being worn by many of my new artisan friends — Mexican hipsters with long hair, leather moccasins, wearing tattered clothing, throwing off a “que onda” with a smile on their face. I was mesmerized by the simple beauty of ancient stones, their patina, their glow. I knew I wanted to recreate that beauty with my own hands, and my journey began. Jewelry made by Marcus featuring hand-cut stone beads. Politically speaking, why have you taken the route of being an artisan rather than having your creations mass produced and by a larger distributor? Connectedness. Either you have it or you don’t. I am connected to every piece I make, from conception to finished item. I am the process, my hands make the stone bead, my eyes find the stones that my hands will work. I sell the piece to the person who will wear it and integrate it into their ritual, their life. Where is the satisfaction in watching your unique creations turned into a mass produced, mass distributed thing? Mass production is about exploitation and disconnection. I want nothing to do with that model. I have been rebelling against that model since I was in college studying Sociology at the University of Oregon. 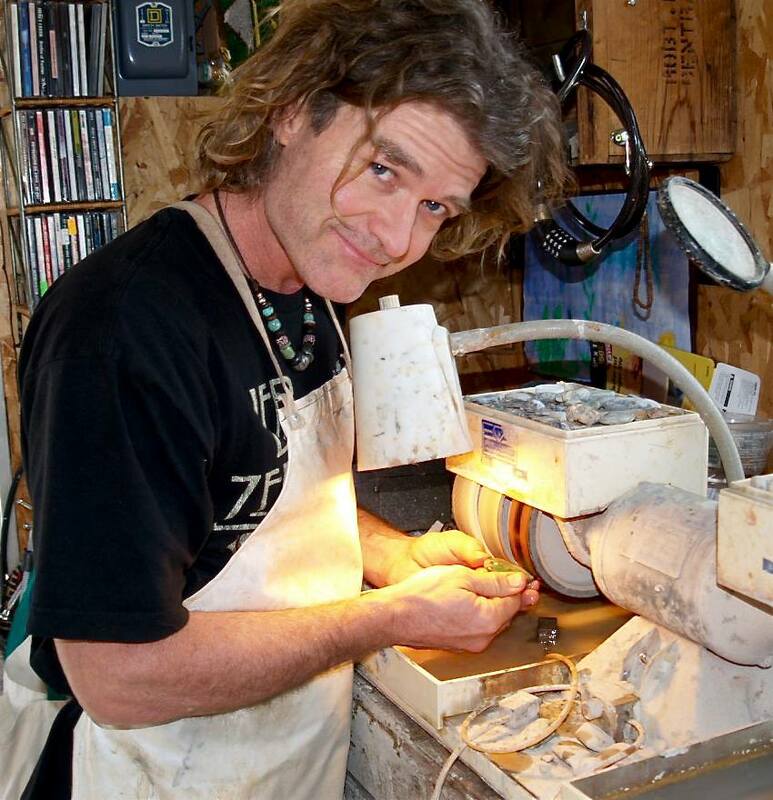 Marcus working a stone pendant in his home based workshop in Talent, Oregon. Who are some role models or mentors you have had in your live who have helped inspire you to do what you do? My Grandfather Howard for sure. He worked in his sheet metal shop about 10 steps from the backdoor of his home on Oak Street here in Ashland. “Tolliver Sheet Metal” was his business. He made heating ducts, gutters, all the bent sheet metal a home would need. He did much of the duct work in many of the elementary schools here in Ashland. He was very much a self made man, salt of the Earth. He always told me to learn a trade, then go to college. I did the opposite, but it worked out fine. Good advice though. So many trades seem to be forgotten by our fast pasted culture. It is still admirable to be an electrician, carpenter, plumber, sheet metal bender, or stone cutter. My craft is not one that is well represented in our culture. I don’t remember anyone saying they wanted to be a stone bead cutter on career day at Ashland Junior High School. As a father of two boys, how has your work changed over the years of raising them and how do you feel they have come to understand the work you do? My hope is that they understand my life as I understood my Grandfathers. Working for yourself on your own terms allows you to be your own boss and always be available to your kids when they need you. I have had the luxury of working for myself and coaching soccer, or going on extended vacation, or taking time to till the soil and plant a garden. There is more to life than just working to make money. I hope that is what they get from my example. Live your life. Don’t spend your life working for another, do what you love. You have played a significant role in taking leadership in the Lithia Artians Market over the past 15 years. What has this been like for you? A constant challenge. We are always attempting to be better as a market and attract more beautiful artisans and their creations into our midst. The market is only as good as its craftswomen and men, its artists, its ambiance. We’re all evolving and so is the market. The market of 2012 is far different from the one I joined in 1994. We have been through a myriad of changes, but we are better in almost every arena. We have incredible diversity, creativity, and quality in our market. The quality of craftsmanship in the Ashland region is really exceptional. 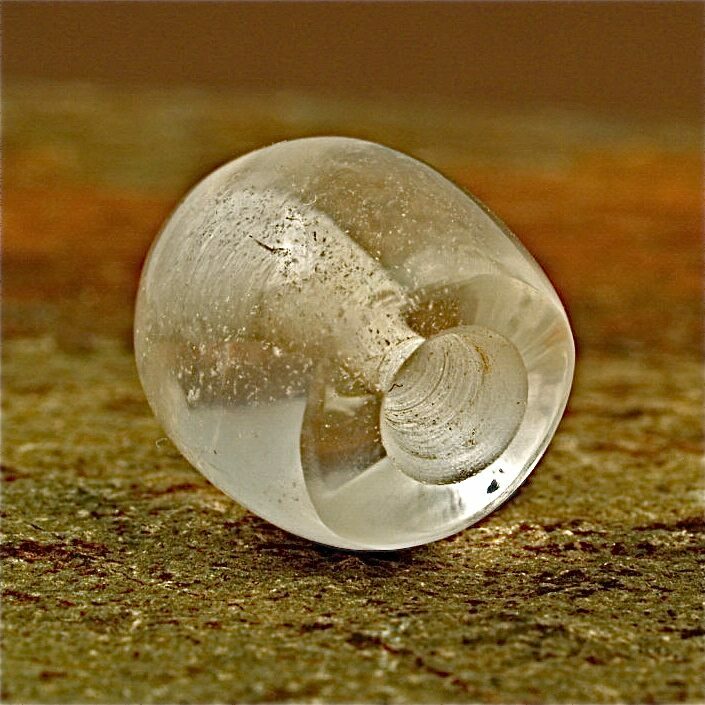 Hand-cut quartz bead by Marcus Scott. Roughly how many people have you sold to or interacted with to over your artisan career? I have been playing with stone beads for 20 years. I’ve sold to roughly 30,000 people in that time. Wow, that is a lot! Most heart felt / memorable moment you have ever had as an artisan? What are some of the qualities that it take to be a successful artisan and stay in the game over the long run? Find out what it is that really gets your juices flowing and do that. Plow into it with all you got and don’t expect quick rewards. Everything takes practice, persistence, and patience. Try to have at least a part time other activity to offset the money thing, because you are not likely to make the ends meet with only an artisan income in the beginning. Maintain a good relationship with your karma (constant work for me) and treat others as you want to be treated. When it ceases to be fun, move on to something else. Don’t get stuck, constantly evolve. Evolution of craft is key to the long run. You get to speak with lots of people. Do you have any interesting insights into the human psychology? People want to connect on a deep level. Folks are hungry for meaning in their life. So much of our collective pursuit has been about survival. People are wanting more than that, people want to thrive. I believe we get to that point by actively pursuing solutions to our common dilemmas. Once basic needs are met, people can reach their own creative higher selves and thrive. We have to make the determination that we are all in this together and figure out how to take care of everyones basic rights to a healthy life, freedom to be who we are or wish ourselves to be, and able to pursue the endeavors that make us happy. Sound familiar? When looking at creations by other artisans what qualities are you looking for? Consistency and originality. They have a style that is all their own, and they do it over, and over with consistent results. Every piece is unique but it all resonates the same energy and you know it is their piece because they come through it. 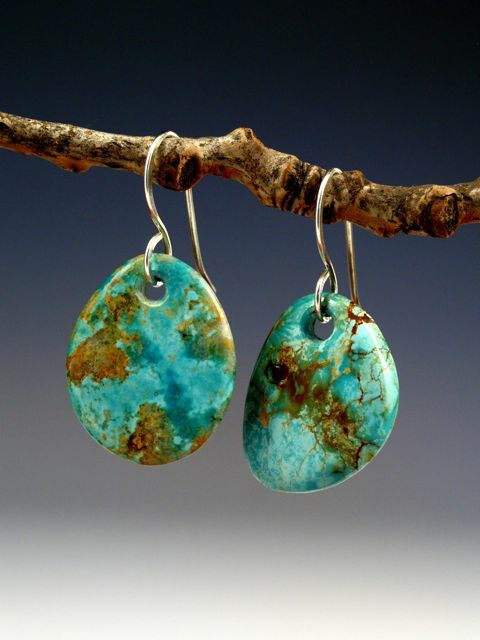 Turquoise earrring set by Marcus Scott. The artisan lifestyle is typically more green, decentralized, independent, and more self actualizing than working in a factory, or a business office space. People are anxious to evolve, be more in touch with the Earth, more spiritual in our practice of being human. For me, working on the lapidary wheel is like a form of meditation or prayer. Like counting beads on a rosary. The artisan model is an ancient model but it has stood the test of time. I believe simplification is key to the future. After 20 years of stone cutting I continue to simplify how I do what I do — less strife and toil, higher quality and consistency. What have been some of the greatest challenges facing artisans in current times? Making the financial ends meet. So many of us live at about the poverty level, or even below. We have learned to live frugally. Frugality is not about being cheap, it is about maintaining a life style without fluff. We all want clean air, clean water, clean energy, good basic food, simple luxuries (like a nice new mug, or a stone bead on a piece of leather), and a roof over our head when it is cold. We shouldn’t have to expend so much energy to maintain the basic needs. Working cooperatively, and with compassion for one another, we are resilient enough to overcome any challenge of the moment. Life is a journey, not a destination, enjoy the trip. I can be found almost every weekend at Lithia Artisans Market, along Ashland Creek on Calle Guanajuato, from mid-April until the end of October. I will be at HeartFest at the Briscoe ArtWing on February 11 and 12. That is a Valentines Weekend celebration of art, hearts, and music. I also do the Ashland Farmers Market on Tuesdays. I tell my story in some detail on my website… TheStoneBead.wordpress.com. http://ashland.oregon.localsguide.com/wp-content/uploads/2012/01/Displayed-jewelry-web-.jpg 1005 1788 Shields Bialasik http://ashland.oregon.localsguide.com/wp-content/uploads/2018/05/logo-1-300x76.png Shields Bialasik2012-01-10 23:18:012013-04-25 17:27:42Marcus Scott - "The Stone Bead"